I couldn’t believe my eyes when I saw a post on HotUKDeals earlier this week regarding a deal at Tesco on champagne. ’tis the season for supermarkets to slash their prices on beers, wines and spirits and the likes of Lidl and Aldi have been doing a good job on the wines front this Christmas. Early December I had another date in my calendar which I was very much looking forward to. Dinner at Chanelle’s House. She had sent us the menu in advance and I had starved eaten very little that day. Four of us dined at Chanelle’s humble abode drinking wine and catching up on gossip and generally being very loud ladies. Such is the nature of my job, now that I am client side working in marketing, I now get taken out all the time. Of course, I’m not complaining. Not at all. Christmas is a time most are stuffed with food without even trying. Here are some of the fantastic places my lovely suppliers took me too with gratuitous pics to match. 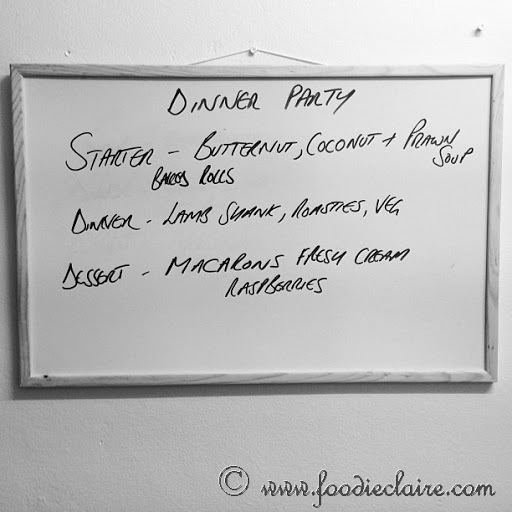 Truth be told – surprisingly, although my name may be Foodie Claire, I had never attended a traditional supper club, where you’re invited into someone’s home, sat amongst strangers (I so hate that word) allowing someone, whom you have never met, to cook for you. I’m not talking Come Dine With Me – oh no no no no no. You don’t win any cash at the end and only those that KNOW how to cook host supper clubs. It’s not that I didn’t want to, if I wanted to find one, I’m sure that I could have stumbled across one very easily, especially in 2012 where they seemed to be dotted all over the place, ESPECIALLY in East London where I reside. Maybe it’s that I am too spoilt and didn’t feel the need to rush to one because I know they are always there. Well before Christmas I pretty much had an opportunity handed to me on a plate. My friend kindly retweeted Zoe’s Ghana Kitchen, who was looking for a blogger that was willing to attend her Ghanaian Christmas feast and take pics. My friend knowing me oh, so well, retweeted and mentioned me. I got in contact with Zoe and told her, not only am I dying to try Ghanaian cuisine as I had never had it before – but I would bring along my boyfriend who is of Ghanaian descent. We got ourselves booked in and three days before Christmas we rocked up to Zoe’s humble abode in Hackney, East London (nice and local) for a festive feast.